NASA has successfully installed the first of 18 flight mirrors onto the James Webb Space Telescope, beginning a critical piece of the observatory’s construction. 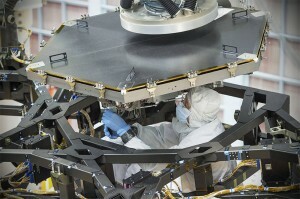 In the clean room at NASA’s Goddard Space Flight Center in Greenbelt, Maryland this week, the engineering team used a robot arm to lift and lower the hexagonal-shaped segment that measures just over 4.2 feet (1.3 meters) across and weighs approximately 88 pounds (40 kilograms). After being pieced together, the 18 primary mirror segments will work together as one large 21.3-foot (6.5-meter) mirror. The full installation is expected to be complete early next year. With NASA’s Earth Polychromatic Imaging Camera (EPIC), affixed to NOAA’s Deep Space Climate Observatory (DSCOVR) about one million miles from Earth, scientists are getting a new view of our planet’s clouds, land surfaces, aerosols and more. Science results from the first EPIC images were discussed Monday at a media briefing at the American Geophysical Union meeting in San Francisco. EPIC captures a color image of the sunlit side of Earth at least once every two hours, allowing researchers to track features as the planet rotates in the instrument’s field of view. New results presented Tuesday at the American Geophysical Union meeting in San Francisco show that atmospheric rivers, significant sources of rainfall, tend to intensify during El Niño events, and this year’s strong El Niño likely will bring more precipitation to California and some relief for the drought. Due to this El Niño, tropospheric ozone, a pollutant and greenhouse gas, is seen decreasing over mid-latitude locations such as the United States, and the risk of fires across the tropics is showing signs of increasing. Duncan and his team examined observations made from 2005 to 2014 by the Dutch-Finnish Ozone Monitoring Instrument aboard NASA’s Aura satellite. One of the atmospheric gases the instrument detects is nitrogen dioxide, a yellow-brown gas that is a common emission from cars, power plants and industrial activity. Nitrogen dioxide can quickly transform into ground-level ozone, a major respiratory pollutant in urban smog. Nitrogen dioxide hotspots, used as an indicator of general air quality, occur over most major cities in developed and developing nations.